Home / General Discussion / IT Project Management boring? Are you sure you’re doing it right? Project Management is the second most boring job in the world, according to a recent study. When you factor in that working in IT also makes the top ten you would be forgiven for imagining that all IT Project Managers must be constantly nodding off on the job. And so it is with IT Project Management. Far from being anywhere near the top of the league of boring gigs, IT Project Management is one of the most exciting and vibrant gigs. Here are 7 reasons why. 1 – What’s Not to Love About Being At The Centre Of Change? When a business goes from good to great, when a company becomes exponentially more efficient, when profit margins increase, when a software roll out is celebrated as making a huge difference … when that’s down to a change you planned, organised and managed – there’s no greater feeling. IT no longer just supports business in many cases it now is the business. In most industries, IT is now at the core of their DNA and as an IT Project Manager, you are the catalyst of ground-breaking change. We are no longer just facilitators of change; we are pioneers and that feels so good! One of my great interests is watching the Project Management as a Service market expand and evolve to meet the needs of business. It’s fascinating. It doesn’t seem like two minutes ago that buying in IT or IT Project services meant hiring a big firm and paying a big bill. This all changed through a combination of commoditisation of IT, customer needs focussed Multisourcing, super agile small service providers and a Project Management services industry where any past of the PM process (even the end to end full process itself) can be bought in. Every customer’s needs are different to the next and the Project Management as a Service market never fails to respond with a solution. Being a part of bringing the two together and delivering real business aligned results through IT is something I will never get bored of. One of my favourite things about IT Project Management is the people that you get to work with – whether they are sat opposite you in the same office or on the other side of the planet. The buzz when a collaboration comes together and produces something far better than you could on your own is second to none. The people you get to meet … fellow Project Managers, engineers, clients, sponsors, stakeholders, end users … they all have a unique back story and so can bring different perspectives. There’s a great sense of achievement when a Project is delivered and the change that you laboured on goes live. I always compare it to a sculptor standing back to admire the statue that he has crafted from a block of stone – but with one big difference. Quite often what we create is from nothing. We have no raw material to be chiselled and whittled into shape just an idea of what needs to happen and an idea of how to make it so. A kernel of a good idea from the boardroom is transformed by you into something tangible and lasting that makes a difference to the trajectory of your business in ways that other departments can only dream of – I mean that new fleet of vans is lovely but the Transport Manager didn’t build them from scratch! What a feeling! And how! That old saying “You learn something new every day” is certainly true of IT Project Management. You have to! For a start, as discussed there’s that ever-expanding Universe of possibility and opportunity, combined with all those different perspectives that the interesting people bring and the fact that no two projects are ever the same. It’s more than that, though. Like a great novel, IT Project Management makes you want to turn the next page to find out what happens next. I am a stickler for governance and organisation and all the things that should ensure you are in control of a Project but I love it when an IT Project comes to life and throws a curve ball. I like to think that there are is no failure in Project Management, just lessons and those lessons are different every day. 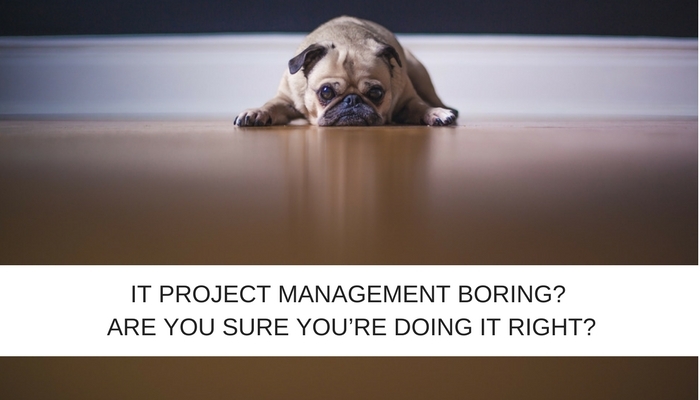 6 – How Can Project Management Be Boring When There Is Literally Never A Dull Moment? I can’t believe how quickly Fridays come around! From clocking in on Monday to laying my keys on the kitchen worktop and pouring a well-earned glass of beer on Friday – the weeks fly by. In between these times we work hard, laugh, cry, cheer … you name it. My friends, who aren’t Project Managers often say things like ‘this week is dragging’. In all my years, I can honestly say that a week has never dragged. Project Management is always challenging but never a chore. As a Project Manager, your ‘stuff to do’ list is usually crammed with tasks and scheduled interactions, presentations to the board, to sponsors, to clients, to stakeholders. There’s no time to get bored! There have been various studies that show that project management is among the fastest growing industries in the world. The more experienced you become the more sought after you become. As an IT Project Manager, you know that your job matters strategically and that is a great feeling. I once met a professional football player who told me he was jealous of what I did because at the end of the day I had a purpose. He wondered what the point of what he did was whereas I was a creator. He then rather spoiled the moment by climbing into his Ferrari with his beautiful model wife and driving off but I am happy to take his comments at face value. The point is when you work hard, often sacrificing weekends or burning the candles at both ends, you want to know that what you did made a difference. You are important and more so by the minute. If IT Project Management is the second most boring job, then Daaaahling you are doing it wrong. If any of your Project Management colleagues ever suggest that they are bored, you could always take them to a football match and show them twenty-two fellas who would kill for their job.